The 34th annual “Eagles Et Cetera” will be held January 25-27, 2013 at DeGray Lake State Park. This beautiful bird which is the national emblem of the US was once an endangered species. 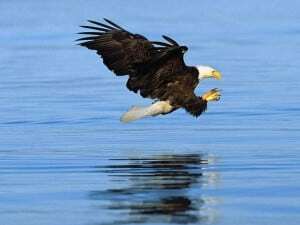 But thanks to conservation efforts and increased awareness, bald eagles are enjoying a comeback and seem to have found a comfortable winter home on DeGray Lake. Arkansas officials also estimate about 200 nesting pairs make their year-round home in the Natural State. Eagles Et Cetera will offer guided lake tours throughout the weekend to view the birds in their natural habitat. There will also be up close views of eagles and other birds of prey thanks to the Little Rock Zoo. Raptor Rehab of Central Arkansas will offer a live presentation, as well as a possible live release of rehabilitated owls and a hawk (conditions permitting). Master Falconer Rusty Scarborough will host a live falconry hunt with hawks on Friday from 2-4pm. This is one of the most amazing spectacles we have ever been a part of, and highly recommend it! You will be taken out to an island and once the hawks are released, you will be asked to traipse across the island, flushing out anything the hawk might be interested in turning into a meal. Be prepared to do a lot of walking over uneven terrain, and if a hawk catches a “live” meal, it is not advised for the “squeamish”! DeGray Lake State Park is a short drive from Tiffany’s Bed and Breakfast. When booking your room, please let us know what events you are interested in and we will make reservations for Eagles Et Cetera for you!